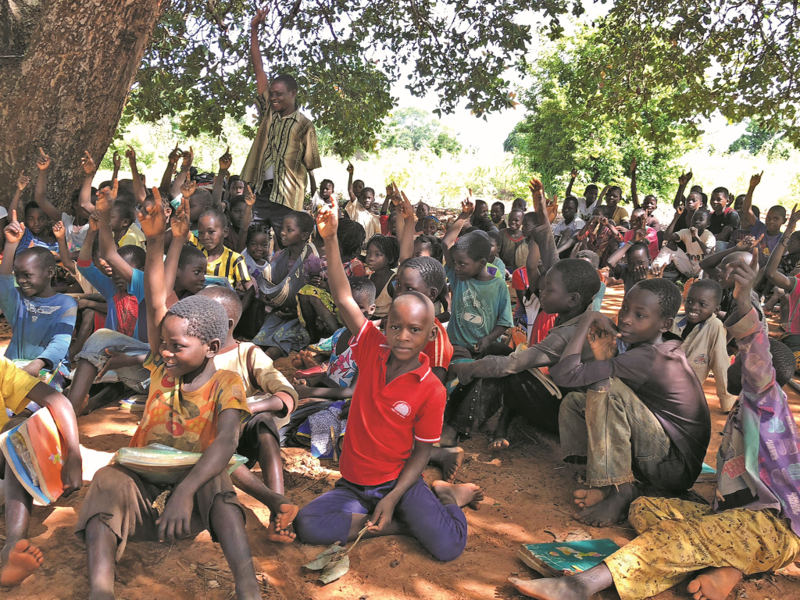 Children in a rural village in Nampula Province, northern Mozambique, are happy to engage in question time at school. Through the work of the volunteer community life teams, the most vulnerable children are at school too. On her first visit to our Mozambican partner, our newest program staff member, Kylie, shares her thoughts about what she saw. Could you picture yourself working in a field day after day, sun blazing, humidity extreme, clean water scarce – only to give away all of your produce at the end of your toils? Add to this that you have your own family to provide for, children to feed and send to school, and you’re never quite sure if your crops will produce enough for the next meal. On my recent trip to Mozambique on behalf of Anglican Overseas Aid, in village after village, meeting after meeting, this was exactly the story of compassion and selflessness that was recounted to me in every community I visited. But this was no coincidence. AOA’s partner, the Diocese of Niassa encourages churches across communities in Northern Mozambique to host ‘equipas de vida’ or ‘life teams’. These are groups of women and men who volunteer in the villages where they live, together identifying priorities for a better community. Sometimes these priorities will include sinking a borehole for clean drinking water, setting up a simple health clinic with access to basic medicines or equipping the local school with hand-washing facilities. And as they live in one of the poorest countries on earth, there is much to be done. The church also encourages the life teams to care for the poorest and most vulnerable people in the community. With agriculture so central to subsistence it’s no surprise then that one of the ways life teams live out this mission is by setting up collective farms on land donated by the community. The produce from the farm is used to provide much needed food to destitute households – often widows, orphans and people living with disability – and any excess is then sold, with the proceeds used to buy essential items such as pens and paper, enabling children to go to school. Bishop Manuel also says that the cultivation of orange-fleshed sweet potato that has recently been introduced by the Diocese to the life teams, will in fact save lives. Like northern Australia, northern Mozambique only has two seasons – the wet and the dry. Last wet season, severe floods destroyed many crops, the real impact of which will only begin to be felt now – at the time when these subsistence farming families would normally be harvesting the produce. But while other crops have been destroyed, the resilient sweet potato, known as one of the world’s best ‘super’ foods, will now be an even more vital source of nutrition, especially for children, pregnant women and other vulnerable people; people like Carlitos and his wife Estela. An older couple, Carlitos has a disability that makes it extremely difficult for him to move about. By the end of my visit, I found that I loved the equipas de vida too.